There’s a reason that La Fortuna remains one of the most visited areas in Costa Rica. Simply put, it is paradise. This small town, located in an area named the same, is a fortune of relaxation and allowing the richness of life to wash over the traveler. 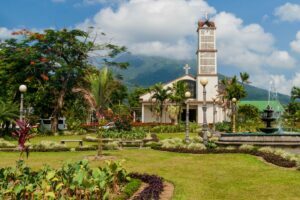 With a magnificent volcano as a backdrop, La Fortuna’s lush natural surroundings and laid-back atmosphere lets the traveler settle into a worthwhile vacation. The main attraction of La Fortuna can’t be missed, as it dominates the view the view from the town. The peak of the Arenal Volcano (5,480 ft) is only 6 miles from La Fortuna and is a sight to behold. Located within the Arenal Volcano National Park (Parque Nacional Volcan Arenal), which offers up hikes and tours through the forests and jungles surrounding the volcano. Along with panoramic views of the surrounding beauty of La Fortuna, activities are plentiful here. The traveler can zipline through the canopies of thick forests, adding a bit of adventure to their vacation. Horseback riding lets them see the terrain from a classic viewpoint. For relaxation, the hot springs in the area allow for a natural way to destress from everyday life. The waters of the area provide opportunities for fishing, kayaking, and white-water rafting. Costa Rica, meaning Rich Coast, is already a top choice for a good portion of travelers. 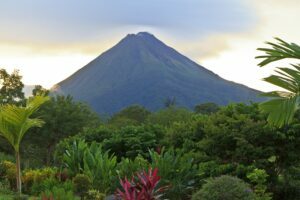 Add on a trip to La Fortuna, The Fortune, and the wealth of experience from visiting the Arenal area is more than worth the visit. With Costa Rica Dream Adventures, this is only one of the many locations that travelers can enjoy while in Costa Rica. Luxury getaway to two of the most visited locations in Costa Rica, Arenal Volcano area and Guanacaste.